With the new ribbon interface in MicroStation CONNECT replacing the MicroStation V8i Task Bar a new set of keyboard shortcuts has replaced positional keyboard mapping shortcuts. Following the section labels at the bottom of each tool grouping there is a letter in parentheses. Pressing one of those letters on the keyboard will display that section of the ribbon at your cursor location. For example, pressing the letter A on the keyboard displays the Attributes section of the ribbon centered about your current cursor location. Another set of shortcuts is controlled by pressing the keyboard Space Bar. This shortcut displays the Popups menu centered about your current cursor location. The top row of tools in the Popups menu corresponds to the tool groupings in the Home ribbon. Selecting one of the top row icons will display that section of the ribbon at your cursor location. The second row of tool icons gives direct access to the most common manipulation tools. The bottom row contains the common Annotation tools and Drawing Aids. 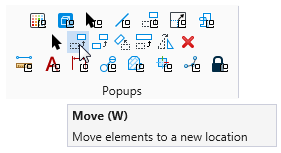 Each of the tool icons in the Popups menu also has a keyboard shortcut associated with it. Hovering over a tool will display the tool name and shortcut. READ MORE MICROSTATION CONNECT BLOGS!